If I have a healthy start to the day I feel all is right with the world. One of my tactics is to try and avoid sugar for breakfast. However, the sun was shining, I had some strawberries, blackberries, grapes, blueberries and cherries that were in need of using up and I had just made my annual batch of rose syrup. As I have indicated on numerous occasions rose marries very well with most fruit – and berries in particular. This particular morning, therefore, I was going to break my suger-free rule. Compared to what it normally has to put up with, this was easy work for my Optimum 9200 Next Generation blender. Twenty seconds and it was done with not a single chunk of coconut oil to be seen. I tried using coconut oil once in my old blender and the resulting smoothie was not very pleasant; it was full of fatty lumps that refused to blend in. Praise be my Froothie blender, which is currently said to be the best on the market. For further information, check out my original review. Buy now for an £80 discount. I managed to get us both to sit down and really enjoy this smoothie – what a pleasure it was. I omitted our normal banana as I wanted the flavours of the summery fruit and rose to shine through and they really did. And when you’ve got some baobab powder handy, in it goes. The kefir can of course be replaced with a non-dairy milk for a vegan version. I added just enough of the rose syrup to flavour, but not to overly sweeten. The syrup took the sour edge off the fruit, but didn’t turn it into a sweet drink – perfection indeed. Just add a spoon. 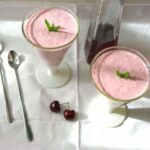 A speedy nutritious fruity breakfast smoothie served in a sundae glass to be eaten with a spoon for a satisfying start to the day. Place everything in a blender and blitz at high speed for 35 seconds or so. Pour into four sundae glasses and decorate with a sprig of mint. Replace the kefir with coconut or other non-dairy milk for a vegan version. Can be kept in the fridge for a couple of days for subsequent hassle free breakfasts. This post contains an affiliate link. Buying through this link will cost you just the same as buying it anywhere else, but I will earn a small percentage. This helps keep Tin and Thyme blithe and blogging. Thanks Nadia. Once you make your own kefir, it produces quite a lot. Smoothies are a great way to use it up. Such wonderful flavours and ingrdients and also a summery colour too! I love the look of this recipe Choclette! Thanks Karen, I’m so enjoying all these summer berries and the colours that go with them. Ooh kefir and jam. Now there’s a thing Margot. Good to hear you were bought up on it. It’s great stuff and I use it in lots of things, but since I discovered smoothies, mostly those. That does look good and so pretty in those lovely glasses. Thanks Janice, bright colours make a big difference. Not all of our smoothies are this pretty. I love the combination! Too bad that berries are not so easy to find where I live. Pretty pictures too! Thank you Diana. You’ve got me wondering where you live now. I remember seeing a demo by Urvashi at the Eden Project a couple of years ago when she used baobab powder in her brownies and was waxing lyrical about it’s benefits. I meant to get hold of some then, but never quite managed it. Now, however, it will be a regular in our kitchen. Anything with rose is phenomenal. This looks superb and such a pretty colour. Agree with the sitting down thing too. So true. Thanks Dom. Discovering how to make rose syrup a few years ago was one of my food highlights. 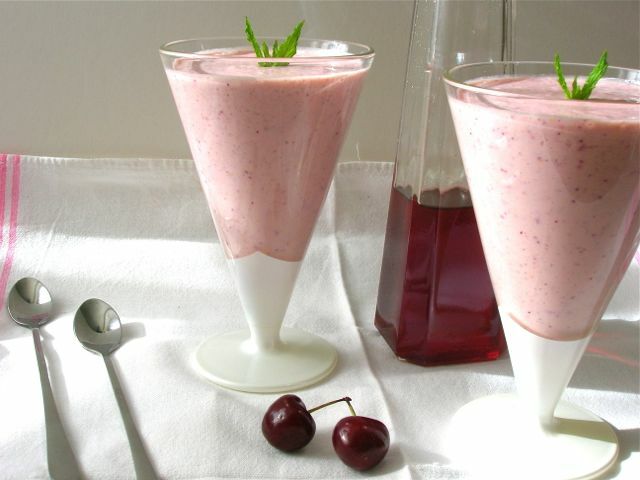 I have some rose essence in the larder, love the idea to add to smoothies! Go for it Kavey. I’ve found that rose enhances many fruits and goes particularly well with berries. This looks really wonderful and I love the add of coconut oil to the smoothie. I often add coconut oil to smoothies Angie, not only for the health benefits, but it makes for a smoother texture and gives flavour too. It look like such a refined item, so pretty and nice to eat with a spoon! Thanks Heidi, I really should do it more often. Beautiful smoothie! I have no idea what kefir is, but I’d be happy to use the Coconut milk like you suggested. That would just taste amazing! Kefir is fermented milk which is particularly good for digestion – a little bit like yoghurt. Any day that starts with one of these is bound to be a good one! This would be a terrific holiday breakfast. Delicious! You’re right Helen – on holiday and out in the garden or on the terrace / balcony. I still have not managed to try Kefir yet but hope to do so asap. Your time will surely come Bintu. I’ll be interested to hear what you think. I also had no idea what kefir we but I bet this would be great with soya or almond milk too! Looks so pretty! I have sachets of baobab powder that needs using up too. Thanks for sharing! Thanks Sarah. My tub of baobab is sadly coming to an end, so I’ll be needing to get some more soon. I have not used kefir before so going to google it. I love rose so this is definitely my cup of tea. Kefir is fantastic for smoothies. It’s sort of like a runny yoghurt, but has even more good stuff in it.